LogFinity has a compelling and enhanced search feature where you can view calls with full details using enhanced list view. Search options include the following criteria: date/time, channel, extension, call-type, duration, caller-id, caller-name, dialed-number, agent-id, agent-name, call-id, tag, note, server and priority. LogFinity provides real-time monitoring of calls and channel status. For immediate assessment of an agent’s performance, calls can be monitored remotely while the conversation is taking place. Dashboards helps you in real time evaluation it’s provide a KPI about your work. Through dashboards you can quickly monitoring your agent performance, Moreover, Agents themselves can evaluate their progress. LogFinity offers an easy and flexible way to customize your recording criteria in a way that matches your needs. It can record all calls or selectively by choosing a certain criteria such as: Call time, Dialed digits, Caller ID, Extension, Call type, Agent ID, and Channel. Tagging calls elevates the identification and analysis of your calls to a higher level, where you can sort, reference, and search calls related to certain tags such as: New customer, bomb threat calls, new offer, and service cancellation. Adding notes to calls allows you quickly and easily to search and retrieve information about the whole call, without the need to listen to it. Also notes gives supervisors the ability to send part of the coaching packages to the agents, to help them boost their performance. To get a full overview of an agent’s interaction during the call, LogFinity Screen Capture records the agent’s screen activities, it helps you to evaluate the agent performance. To get a better view and understanding of how well your telephony environment is working, LogFinity delivers a powerful Reporting Feature that gives you a complete reporting and statistics of the activities in the system, such as calls traffic, amount of calls per trunk and extension, calls type, and full details of the recorded calls. Moreover LogFinity supports report exporting into multiple formats such as Microsoft Excel and PDF. LogFinity Compression increases system storage capacity while achieving a high quality of recorded conversations. LogFinity uses an excellent MP3 quality that gives you up to 139 or 278 hours of storage per 1 GB. Enterprises need to secure their recordings by storing them in a safe place so recordings won’t leak out of the hands of authorized personnel. The LogFinity Encryption feature achieves maximum security and confidentiality for recordings by encrypting each recorded call so it only authorized users can play it. – Automates the communication of evaluation results to agents. – Provide personalized timely feedback and support. 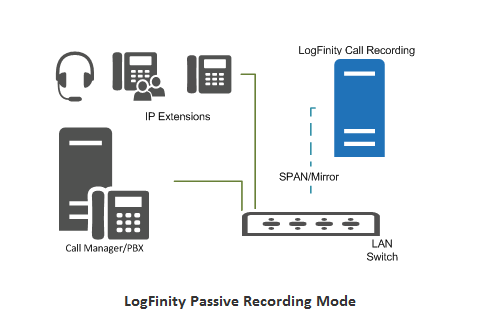 LogFinity provide a high level of security and controlling on calls. LogFinity call recording system allows authorized users only to view customer’s saved information and track every single interaction for all users who are accessing the system. To make backup handling easy to use, and to minimize the cost and the effort spent on the backup process, LogFinity backup application helps organizations achieve that. It does the backup process for all recorded calls through a single system. Moreover, Backup criteria give you the ability to select what calls to be backed up. such as channels, extensions, agents, call type, date/time, duration, caller-id and dialed digits. Multiple-privileges can be given to users and groups to access the system and recorded calls. You can set recording, playback and administration rights according to your enterprise’s unique preferences and needs. No one will be allowed to see calls information or listen to calls unless he/she has a proper authority. LogFinity runs up to 500 channels per machine; with no limits of the number of machines that could be used, increasing the capacity up to thousands of channels, making LogFinity extremely scalable, meeting your business needs. To make sure the system, including software and hardware, is running smoothly, LogFinity sends detailed alarms and notifications to proper users via email, SMS or the external software/hardware alarm system for instant notification about any issue. Passive recording mode is commonly used in VoIP recording. It captures signalling packets and voice traffic of monitored extensions, devices or trunks via SPAN/Mirror port. In active recording mode; the recording system will be connected to PBX/Call Manager via SIP trunk and CTI link. the PBX will be configured in order to send the voice traffic and call information to the recording system. TDM is a passive recording technique for legacy telephone channels (Analog, Digital, ISDN and CAS). A high impedance recording boards (PC hardware) will be connected in parallel (tapping) to the monitored extensions and trunks.